I took an Operations Management course over 20 years ago at Kellogg. It was taught by a highly-regarded professor who was passionate and very knowledgeable about the topic. I can't recall his industry experience but vividly remember that I was able to apply what I learned to my then-job in the corporate world. As an entrepreneurship major, it was an experience that left me appreciating the value of understanding operations. And while my career took a 180-degree turn just a few years later - away from corporate and towards startups - that appreciation stayed with me. As time went on, I came to understand that operations in a large, established business is typically about optimization: how can a company streamline processes and reduce inefficiencies so that profit can be maximized? But for a startup, it often takes many years to get to the point where its operations are so established that optimization becomes a priority. Instead, based on my experience, a startup's operations is all about creating processes and systems to replicate what a company does, and then scale it. It's about designing processes that new or different employees can execute, reducing the company's reliance on specific individuals. And it's not just about lowering costs to improve profitability but, ideally, having systems and processes that can also help the company generate more revenue, and faster. One part of the Junto curriculum is a series of 12 half-day classes, eight of which cover management topics (the others address emotional intelligence and leadership). These eight were influenced entirely by dozens of interviews we conducted a few years ago with startups around Chicago. The purpose of those interviews was to uncover the areas that founders worried most about , spent the greatest time working on, or wished they had learned more about as they were launching. When we were done with the interviews, we looked for patterns among the findings to help determine what topics should be covered by the classes. Interestingly, operations (or systems/processes) wasn't that high on the list. 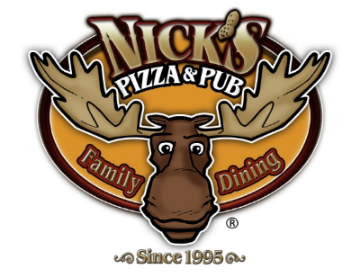 In the summer of 2013, after some nudging, I finally made the trip out to Nick's Pizza & Pub, in Elgin, Illinois, about 40 miles west of Chicago. I met Nick Sarillo, its founder and owner, a few years prior and, almost each time we spoke, he invited me to visit. Because of the distance, I hadn't been able to take him up on the invitation until that summer, when I happened to have a meeting halfway to Elgin and decided to make it a day out in the far suburbs. That visit is what caused me to change the Junto class schedule halfway through our first cohort. I made an executive decision to pull out a class on Marketing and replace it with a class on Operations & Metrics because, for the first time, I saw a self-sustaining business that struck the fine balance between systemization and personality. 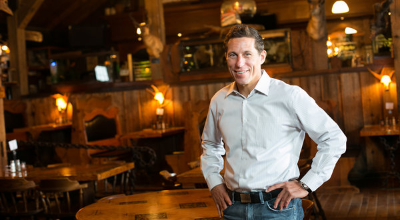 And the results told the story: its profitability, employee retention, culture, and efficiencies far exceeded industry norms because of how the restaurant operated. I asked Nick if he'd lead an Operations class at our downtown Chicago "campus" at Foley & Lardner, the law firm where we hold our classes. He accepted, and I was thrilled. We began the process of designing the half-day session and I could tell that Nick was looking forward to the experience. But about a month into the design process, it dawned on me that the experience I had at Nick's restaurant is what inspired the change to the curriculum. How would Nick be able to explain his operation with enough visualization for the Junto I students to "see" what he was talking about? Sure, pictures and videos would help, but nothing beats being there. After all, Nick's is a pizza restaurant, which everyone is able to relate to and understand. From an education standpoint, that makes application to one's business much more likely. 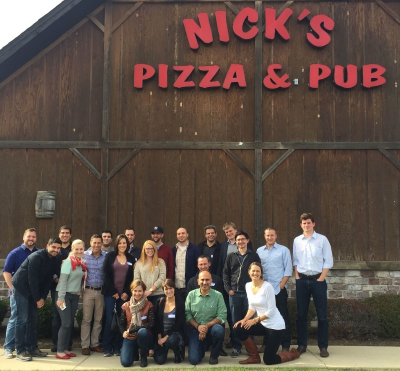 So after consulting with my Junto Partner, Catherine, we decided to pitch the idea of our first field trip class, to visit Nick's Pizza in Elgin. He gladly agreed. Upon announcing the change in curriculum, a few of the Junto I students asked me, "What are we going to learn at a pizza joint?" I could only reply with, "Just wait." That decision, and the subsequent field-based class, changed the entire Junto experience. While we were already getting highly positive feedback from our inaugural class, "seeing" a business' operations that demonstrated systemization and process-based results took the experience to another level. It was something we could never replicate in a conventional classroom environment. When I reflected back on all those interviews and wondered why operations and processes hadn't come up as a dominant theme, I theorized that it must have been because most of the startups we interviewed were very early stage. Without checking the list, I believe most were either at the seed stage and/or with little revenue. Once we began recruiting for that first Junto class, however, we began attracting slightly larger and older companies. And that trend continued with Junto II. So interestingly, the topic of operations and scaling is more relevant to the companies we actually serve than those we thought we would. Fortunately, the decision to include this topic was the right one. The class was so highly rated by Junto I that we had no choice but to repeat it for Junto II. So last Friday, we again made the pilgrimage to Elgin to visit Nick's. And again, we heard that it was a remarkable experience for all who attended, even those who boarded the Junto bus at 6:30 a.m. to make the 90-minute journey. Not only was the field trip experience enjoyable for the cohort, it was an invaluable learning experience. And while it would be impossible to share everything that our students learned, here are some highlights. 1. Personal experiences can be systemized. At Nick's, just like at Disneyworld, employees are trained to treat guests in a very specific way so that customers have a consistent and extraordinary experience. For instance, the host is expected to welcome guests with a smile and by specifically using the "Nick's Pizza" name in their greeting. They're also asked to chat with, or tell jokes, to waiting guests during busy periods, taking their minds off the fact that they're waiting to be seated. And in doing both, the host is encouraged to use his or her own style and language, making their delivery personal and authentic while still following the company's designed process. 2. Systems don't require burdensome manuals. At Nick's, "ops cards" are used to identify the specific processes that need to be followed in order to complete particular operations. There are ops cards to open and close the bar, ops cards for cleaning the kitchen, and even an ops card to update all the ops cards! One end is red, to indicate that a process hasn't been completed; another end is green to reflect a finished one. 3. Consistency is achieved through specifics. Nick explained that all of their pizzas are made a particular way. Pizza makers are trained to make a pie with a specific handful amount of cheese, ladles of sauce, and pieces of ingredients. There is a "design" to the pizza, and there is a time limit in which it should be made. Nick emphasized that they're able to make 600-700 pizzas on a busy night only because the team is trained on specifics that can be measured over and over again. 4. Financial transparency eliminates the need for a bookkeeper. Not only does the practice of open-book management empower employees to build a culture of togetherness, it also makes financial management self-sustaining. At Nick's, they practice The Great Game of Business, enabling every member of the team (even those as young as 16!) to take ownership of a line item on the company's income statement. With weekly half-hour huddles, at which all numbers are updated and presented, the company avoids the need for a bookkeeper...because they're keeping the books. 5. Raises and promotions are based on certification. One of the hardest decisions company founders have to make over time is how to compensate and reward employees. In the early years, it's often an arbitrary, intuitive process. 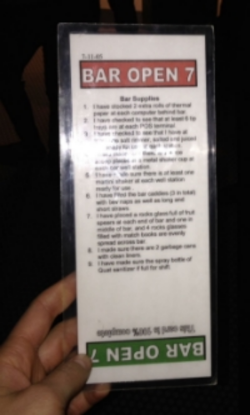 At Nick's they've developed a system through which employees earn raises and promotions by getting trained and then certified in a specific role or task (such as dishwashing, dough table, or host stand). Once they've achieved a certain number of certifications, a raise kicks in automatically. And all the training and coaching is done by other employees (who themselves may be working towards certification by doing so), building a self-sustaining employee development system. Everyone knows what each person makes in the company because they literally wear their "position" on their head: different color hats represent different positions, and each color is shown on a board with its corresponding pay. Needless to say, we're tickled to have included this class in the Junto curriculum. At first glance, visiting a pizza joint is a reach for entrepreneurs who run technology, service, or consumer goods companies. But upon reflection, and more importantly a visit, it's pretty simple to see the value. First, a pizza restaurant and its operations are easy to understand, making the learning much more effective. Second, the students have the opportunity to learn from someone whose business is a shining example of a highly systemized operation (and among the top-performing, independently-owned restaurants in the country). Finally, and most importantly to the educational process, it's a ton of fun. As stated in a photo that's on our home page, "the best learning doesn't feel like learning at all".